It’s my first veganersary! Granted, I was not necessarily (ok, at all) completely vegan (for full story see my meme post) last July 7, and I get drunk and eat cheesy food (pun intended), and I love to eat Taria’s pastry creations (she’s fruitarian but the best pastry chef in Atlanta, so again, humor me), but it’s been a good year. I wish I still had my old blog and could trace what I posted a year ago, but I can’t. Sad. I’m forever grateful to Rachael and Kyle and Taria for convincing me through their eating habits that veganism is totally possible–even when one is a pastry chef–and also to you guys, the blog community, for giving me hundreds of new recipes to try out and friendly support over much trial and error. So, as a thanks and to celebrate, I’ll leave you with a tasty breakfast. I know you all know how to make vegan french toast. And I usually make it with applesauce or smooshed bananas. Or sometimes super fancy with challah and vegan ricotta (smile). But with the usual recipe, the bread gets too much liquid in it and stays soggy, even if you fry it till it burns. So I experimented with a bit of vegan yogurt, added spices, fried it, and oh-my-goodness it was just like regular french toast! Crispy fried on the outside, not soggy on the inside, spicy-sweet…yeah, a pretty damn good simple veganersary breakfast. Much love to you all, you’re the best! Here’s to another wonderful vegan food-filled year! Mix together the yogurt and spices in a shallow, wide dish. Dip the bread slices into the yogurt and cover both sides with the mixture. Fry the bread over medium head with a dash of olive oil until brown on both sides. Serve with maple syrup, powdered sugar, nuts, berries–whatever you feel like! happy veganersary to you, Jes! Happy 1st veganersary!!! What a scrumptious breakfast you made, to celebrate with – yum!! Woohoo, happy veganersary to you!! A delicious and excellent way to commemorate the day! Happy veganersary! How fun! Here’s to another cruelty free year for you! Happy veganersary! That breakfast looks like the perfect way to celebrate! Congrats! Still not there yet entirely … but working on it. Happy veganversary! It’s a shame I don’t recall the exact day (or even month) that I made the switch, since I’d love to celebrate with delicious french toast like this, too. happy veganersary! we’ll definitely have to try this french toast recipe this weekend for brunch! Happy Veganersary! That is quite an accomplishment. 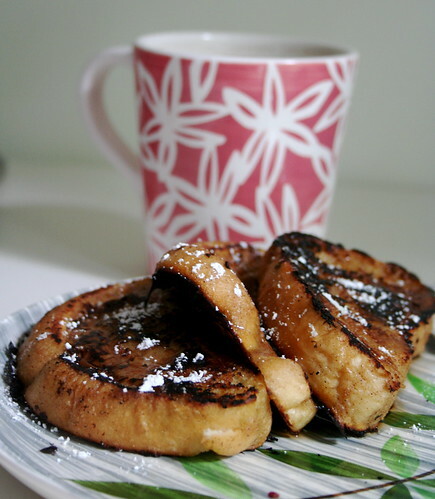 I will have to keep this recipe in mind – I love French toast.Great blog! Happy Vegan Anniversary to you! wow that french toasts looks amazing! i’ve experimented with vegan french toast before but haven’t really found a recipe that i’d want to try again. i’ve found that soy yogurt was the key to some of my other recipes, so i’ll give it a try with the french toast! thanks for the recipe and happy vegan anniversary!